Spain's biggest theme park, themed around civilisations and home to rides including the 249ft tall rollercoaster Shambala. PortAventura is an expansive theme park resort on the east coast of Spain's Catalonia region, about an hour's drive south of Barcelona. It is currently the largest theme park in Spain, and the sixth most visited in Europe. In 2017, Ferrari Land was added as a second theme park on the same site. The park has five main areas, each themed after a major civilisation, and there is also a kid's area featuring characters from Sesame Street. Unlike many parks, PortAventura's layout does not follow the hub-and-spoke model where each land is easily accessed via a central plaza. Instead, PortAventura's lands are laid out in a circle, meaning guests must follow one main path all the way around the park to get from area to area. Mediterrània is the main entrance area, themed as a Catalonian coastal town and is set around a large lake. The major attraction is Furius Baco, a dreadfully rough Intamin Wing Coaster with a strange backstory around an out of control vineyard machine. Following around the edge of the lake, the next area is Polynesia, a beautiful oasis that acts as a respite from the general busyness of the rest of the park. Tukuki Splash is a flume ride set around the area's large volcano and is the only major ride in Polynesia. China lies at the back of the park, and is the an extensive area currently home to several large attractions. Dragon Khan is a rollercoaster from B&M which, up until Colossus was built at Thorpe Park, held the record as the rollercoaster with the most inversions. Intertwining with Dragon Khan is Shambala, another rollercoaster from B&M. Whereas Dragon Khan is a little rough these days, Shambala is beautifully smooth with large swooping airtime hills. In the summer months, these are joined by Angkor, a very well themed Splash Battle ride behind Shambala. 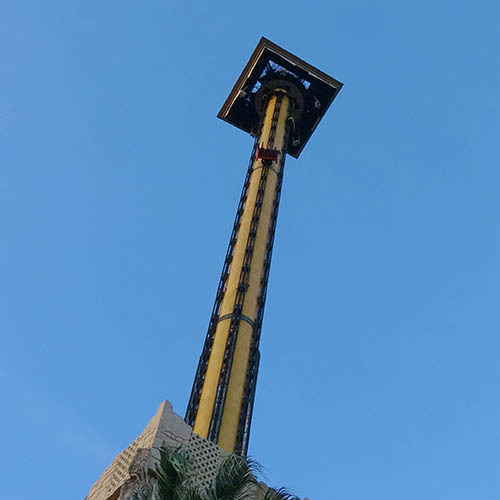 Continuing anti-clockwise, the Great Wall of China themed path gives way to Mexico which is dominated by the 330ft high Hurakan Condor drop tower. Also in the area is El Diablo, an old Arrow Mine Train which is refreshingly not as rough as other examples, and the spectacular Temple del Fuego show. The final civilisation area is Far West, the staple theme park Wild West land, but nicely done with high quality theming. It is another very large area, hosting both of PortAventura's wooden rollercoasters: Stampida, a racing woodie that sadly is rough enough to give a rather unpleasant ride; and Tomahawk, a junior woodie that is much more enjoyable. Also in the Far West are two water rides: Silver River Flume and Grand Canyon Rapids. Alongside PortAventura's huge ride collection and the consistently superb theming, the park has some brilliant high quality shows. There are a number of seasonal events throughout the year, including Summer Nights and Halloween. PortAventura's Christmas event sees the whole park decorated and a set of special festive shows on offer. Given the amount of effort put into both the special events and the day-to-day running of the park, it is easy to see how it has become one of Europe's most popular theme parks.